It is a very effective product to instantly bond small parts of all kinds of materials such as metal, ceramic, ceramic, plastic, rubber, leather, vinyl, cork, paper, wood, fiber and chip board. It is used in existing ultrasonic welding, It is an economical product that can replace complicated and expensive mechanical fastening methods such as ultrasonic welding, two-liquids type adhesive, heat hardening products. Small parts of all materials such as metals, ceramics, ceramics, plastics, rubber, leather, vinyl, cork, paper, wood and chip board. Sinaoacrylic instant adhesives react with the water in the atmosphere and contact the two adherends to produce rapid curing by proper pressure. Existing instant adhesives show excellent adhesion in rubber and wood, but it is difficult to overcome the shock, vibration, exfoliation and heat resistance required by specific industries. 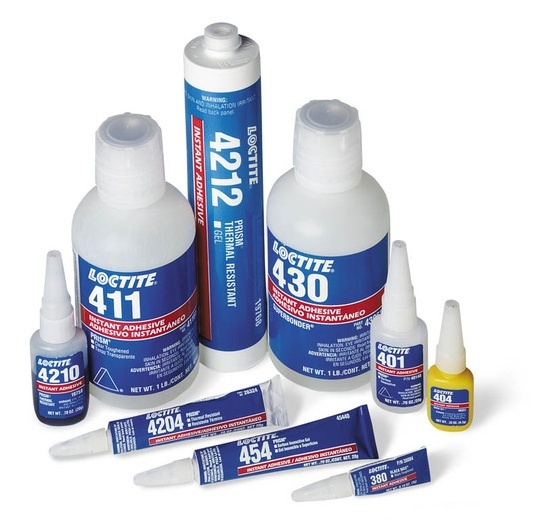 Loctite provides products that improve odorless, whitening, shock, vibration, moisture and heat peel strength according to the demands of these industries. Fixture Time 15 sec. 15 sec. 90 sec. 30 sec. 90 sec. 50 sec. 50 sec. 50 sec. 120 sec. 5 sec. 5 sec. 20 sec. 20 sec. 30 sec.